The Historic Old Sacramento Foundation, in partnership with California State Parks, the City of Sacramento, and certain private property owners have a specialized guided tour program exploring Old Sacramento’s underground and hollow sidewalks. The successful tour program draws locals and tourists to the National Historic Landmark District and State Historic Park for a new experience in Old Sacramento, and has them walk away with a new image and understanding of the area. Visitors learn of the multiple natural disasters that challenged the City from its start in 1848, including fire, disease and flooding. The most devastating of these threats was flooding. On multiple occasions during the city’s first years, rising waters from the Sacramento and American Rivers—the city’s major highways and keys to its economic and political success-inundated Sacramento at tremendous cost and human loss. They counteracted the force of nature by building levees, re-routing a river, and physically raising the streets of its business district over 20 feet above the flood plain. 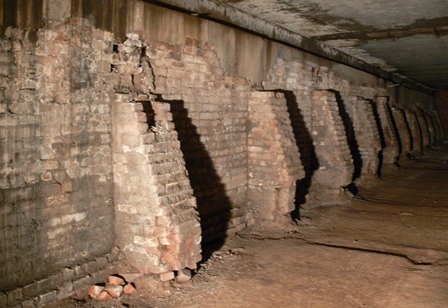 Visitors on these Historic Underground tours gain a sense of understanding and awe regarding the massive political and physical achievement it took to raise the streets, and how it permanently changed the City’s landscape. Most important of all, they earn about Sacramento’s unique historical identity as the only city in California to raise its streets, and one of only a handful to do so in the entire nation. The raising of the streets and businesses in Sacramento was an expensive, time-consuming, and physically demanding project that spanned two decades and required the support of the entire community. The success of the project’s execution demonstrates the young city’s ardent determination to survive. Today the city’s underground is our direct tie to the efforts taken to sustain and grow the city in the nineteenth century.